No matter what you call it, Atlanta is where the action takes place. Our home city is one of the best places to live and work as a filmmaker and game developer. Atliens are making it happen in the gaming world, with the third highest volume of video game planning activity and the fourth highest compensation levels in the industry. A-Town is down, y'all. To get the most out of your TERMINUS experience, we recommend traveling to the ATL on Thursday, June 14, 2018. Programming begins on Friday morning and runs until Sunday evening. If you're flying, the closest airport is Atlanta Hartsfield Jackson (ATL). 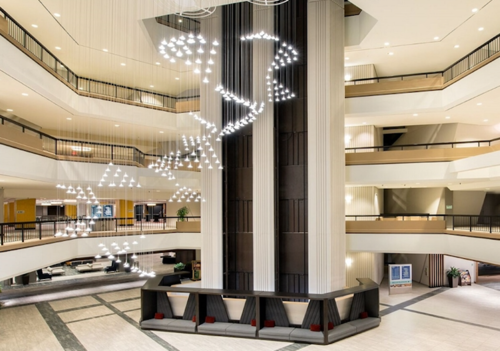 Conveniently located in downtown Atlanta, the Hilton Atlanta is our host for all Workshops and Panels, Expo and Game room and Screenings. Discounted room rates are available for $129 (book by May 23, 2018). Visit our Hotel page for more information, or our portal to book your room. Proceed on 75/85 North. Exit at 249B (Peachtree Street). At first light, turn right on Peachtree Street. Next light, turn left on Ralph McGill Blvd. Next light, right on Courtland Street. The hotel is one block on your left. Follow GA 400 South to I-85 South. Follow 85 south and take exit 249A (Courtland St). This is a one way street and the hotel is one block ahead on the left. Exit at 249A (Courtland Street). This is a one way street and the hotel is one block ahead on your left. Self parking is available at the Hilton Atlanta for $30 per day, and $40 for Valet. There are additional surface and covered parking ranging from $6 to $30. We suggest using Parking Panda to find available options and reserve a spot in advance. Peachtree Center Station is a 9 minute walk to the Hilton Atlanta. Fare is $2.50 for a one-way trip. If you'll be using MARTA multiple times, day passes are available starting from $9.00 up to $16.00 for 3 days. Visit itsmarta.com for more information. Free MARTA parking is available at most train stations, with overnight and long-term parking starting at $5 per day. Visit martaguide.com to find parking, as well as check availability and current prices. Parking availability and prices for parking and MARTA are subject to change at anytime. The above information was last updated on October 9, 2017.